The largest single participatory sporting event in Northern Ireland is set for a massive year of change and there are 26.2 miles worth of volunteer opportunities available to suit all! Volunteer NOW and make history with the Deep RiverRock Belfast City Marathon in 2019! 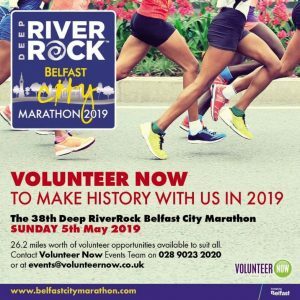 Home > News > Volunteer NOW and make history with the Deep RiverRock Belfast City Marathon in 2019! The largest single participatory sporting event in Northern Ireland is set for a massive year of change with a brand new, flatter and faster route for marathon participants, a new marathon start location on the grounds of the iconic Stormont Estate and history will be made by moving the event to a Sunday for the first time ever…Sunday 5th May 2019! As the Belfast City Marathon enters its 38th year, the event management team are preparing for a huge year of change with the help of Volunteer Now. “We want all our participants to enjoy the experience of running the Deep RiverRock Belfast City Marathon. Each year a highly skilled team pull together to ensure operations run as smoothly as possible on the day. This year, with a brand new marathon route, we have even more ground to cover as we encompass North, East, South and West of the city. Quite simply we could not deliver the largest single participatory sporting event in Northern Ireland without our dedicated volunteers. We are delighted to work once again with Volunteer Now to encourage volunteer participation and help make our event a success. Deep RiverRock Belfast City Marathon will donate £100 to each group and ONE free entry to the event of their choice (Marathon, Team Relay, 8 Mile Walk or Fun Run) if they provide between 6-10 volunteers for race day 5th May.